Of course you’ve got style. You just don’t have a lot of space! Well, so what? You don’t need a big living room to live large, you simply need to creatively (and strategically) update your space. We’re here to help with tips you can use to make your living room look and feel bigger. The most important thing to keep in mind? This is your space, so it should reflect your personality. But décor aside, it’s called “living room” for a reason -- you should feel totally comfortable living in it. So take these tips as ideas, and make them your own. Hanging curtains from just below the ceiling, and letting them drape to the floor. Think solid colors or smaller patterns and minimal bulk fabrics. Or install window blinds or shades that match the walls for a sleek, seamless look. Paint the ceiling to match the walls. Hang a mirror across from a window to reflect natural light, or on a wall where it will reflect items in front of it. Light-colored walls and flooring are brighter and feel airier. (Good old white may seem stark, but it goes with everything.) Darker colors make rooms feel, well, darker, as well as smaller. On the other hand, a single darker wall tends to visually recede, making the room seem larger. And it can make a strong, sophisticated statement. Bold accent colors give small spaces pizzazz. Ahhhh. The feeling of de-cluttering. Removing unnecessary or bulky furniture and clearing up valuable floor space will breathe new life into your room. Wall-mounting items adds space. Start with your TV. 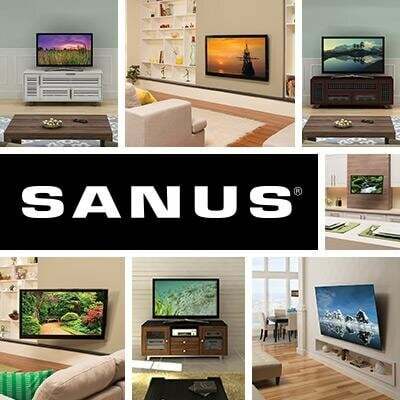 SANUS makes easy-to-install TV wall-mounts to fit every room. And cable tunnels to hide cords, too. But don’t stop there. Wall-mounted sconces or swing-arm light fixtures look fresher and more modern than table lamps. Resist the temptation to shove key furniture pieces up against the walls. Oddly enough, leaving some space behind furniture makes your room seem bigger. If you can, put a narrow console or a floating shelf behind the sofa. And Speaking of Furniture . . .
Who says you have to have the traditional living room “suite”? You’ll go nuts trying to cram a sofa, chair(s), coffee and end tables, lamps, etc. into your small space, so why bother? For small living rooms, less is more. Lower profile furniture allows your eye to travel across the room without interruption, so the space feels larger. Too many small pieces will look cluttered and cramped, so go for a couple of “statement” items you love instead. Think comfort. Then show your style by using small-scale, unusual items to accessorize your key pieces. If you must have a coffee table, pick one with shelves or drawers for storage. But any right-height object with a flat top can hold a book, a beverage, and a bowl of flowers – upended baskets, thrift store finds, etc. Lucite is sturdy, visually light, and very trendy right now. Place a couple of small “tables” in front of your sofa, others next to chairs, and rearrange when the mood strikes you.